Everybody who helps remotly via phone or chat friends and family with their computer problems knows how long it can take to explain step by step to solve the problem. Especially if the other person is a completely beginner. It can be a very time consuming and nervous wrecking process to help the person on the other end of the telephone line. I have to deal with this problem several times a week, when friends need my help to fix something on their computer. Luckily there are some Remote Control Programs on the market, where you easily can log into their computer and see everything what’s going on, like you are in front of it. The selection of these kind of programs is huge, like Remote Desktop, Logmein, pcAnywhere and much more. Unfortunately most of them aren’t free or they have a time limit. Since recently Teamviewerturned their time limit off for private use and you can help your friends as long as you need, without any interruptions. But don’t forget, only for private use, for commercial use you have to aquire a license, which is, compare to others, very affordable. This program is even for a beginner very easy to use. You just have to Teamviewer“>download Teamviewer 3 from their website. You can save the program or you can just execute. An installation like you need for a normal program is possible but not neccessary. The user who needs help starts the program and tells his friend (the Geek) the ID no. and password, which is listed in the window. That’s it, now the Geek has to type in the ID no. and password to have full control over the computer, it looks like he is in front of the other pc. You can also get this program in German, Spanish, Portugese, French, Dutch and Danish. Show and share your software, PowerPoint presentations etc. What program are you using for remote control? Which program or method do you like most, and why? You’re right, there are many remote support tools out there and finding one that has “no strings” can be a long-winded one. Thanks for finding this one and producing the review..I will certainly add it to my growing list of tools that I use to support the family!! I hope that will be a program you are looking for. I’m very satisfied with it. Yes man, I have faced the problem of solving computer problems for my friends and family via phone or chat several times. During those times I wished if I could help them with their PC on my desk! Personally I used only windows ‘Remote Desktop Connection’ program occasionally for my professional purpose. But that’s something different I feel. This ‘Teamviewer’ would be a nice experience I hope. I am going to download it soon. Glad you find this tip useful and let me know how you like Teamviewer. Would be interesting what your experience is. What a great program! I’ve not found any other on demand remote assistance programs that are completely free – even for non commercial use. I would suggest that you turn off incoming connections though, otherwise the person you are helping will be able to reverse the process and view and control your computer! 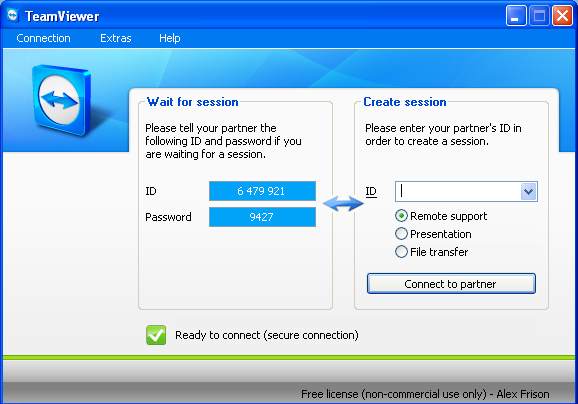 This is really easy to do – in TeamViewer options, go to security and bring the slider all the way down. thanks for your comment and for your tip. Also they do have a new version, 3.5. Did you check it out? You can even restart the computer remotely now and some other nice features. Everything for free – for non commercial use. The last week. Teamviewer started to close itself after 5 minutes of usage. Its a shame, it was great. Do you know any other software that works the same way but free and wasy? Thanks for the link Johnny, indeed a helpful post there. Teamviewer started to close itself after 5 minutes of usage. i used this for about a yr no problem. didnt need to use it until recently. on doing so the session ends after 5 minutes. ive had countless emails from teamviewer saying they dont know what the problem is and cannot fix it. ps – forgot to mention…its rubbish! Sorry to hear that raggasmurf, you are the first person I heard has problems with it. I can understand your frustration. So if it’s rubbish, any better alternative? The 5 minute timeout might be coming from TeamViewer QuickSupport. Try connecting between 2 TeamViewers and see if it still happens. i need help, i cant connect to teamviewer server ever, it say acces is denied! evern try to delete reg files but no luck. Hey Devil, I never had this problem, and I cannot help to figure out the problem from here. Did you contact the Teamviewer Team? I have used TeamViewer, LogMeIn and Proxy Networks take and I have to say I go with Proxy. That said, I think people should look around, try some demos and spend some time with these programs before they make up their mind. Thanks for mentioning the other programs. Everybody should test those programs and see which is his favorite. I preferred TeamViewer and still happy with it. Anyone received info on how to end the 5min timeout? My tech told me to update to SP2 on the server, but I dont see why since nothing has changed on the client-side. Is there still a 5 minute timeout with Teamviewer? I’m not sure I was aware of this. Did this just go into effect? I use Teamviewer to fix my friends and families computer problems. Another good remote support software that we use at work is ScreenConnect . for a free remote connection without any limitation, try logmein. it use web browser (best view with firefox) to display remote screen. I tried version 5,6,quick support 7 all these versions has automatically timed out or expires within 5 min. I am using windows XP professional as my OS. Anybody knows how to resolve this issue?